Vitamindeficiencies are often caused by an unbalanced diet. Making sure you get yourdaily supply of essential vitamins helps keep your body in top physical shape.Our Daily Vitamins provide you with everything your body needs. Get the verybest from fruits and vegetables in capsule form. Percentages refer to the daily required dose. Get straight to it. No detours. The productionmethod used in the manufacturing of our Daily Vitamins makes them stand outfrom the crowd. We use extracts from real fruits and vegetables for maximizedvitamin content. Our raw materials come from high-quality European farms thatdon’t use pesticides or chemical fertilizers. The combination of oranges,apples, broccoli, carrots, spinach, and other fruits and vegetables provides awide range of nutrients. You can be totally sure you’re getting a daily supplyof the highest quality vitamins. Our Daily Vitamins. In a class of their own. 1 As a percentage of the reference values for daily intake (= nutrient reference values). Recommended use: 2 capsules daily with sufficient liquid. Take 2 capsules (1 portion) a day with plenty of liquid. I feel very good after I started using the vitamins. So good for me. don´t eat so much fruits so perfect alternative. I like. i really like the daily vitamins but the capsules are pretty big. the daily vitamins are the perfect supplement to my nutrition. I still prefer consuming vitamins through fruits and vegetables, but this is a good option to make sure I get enough of my daily vitamins. I like the fact that this supports my daily fruit and vegetable intake to make sure that all vitamins are provided to me in adequate amounts. I feel so much better taking the Daily Vitamins. That product is great. I´m a total fan. For me as a vegan just great! A vitamin supplement without synthesized vitamins? I have to try that!!! Vitamins are essential to life, because they play an important role in human metabolism. They need to be obtained through food on a daily basis because, with the exception of vitamin D and niacin, the body cannot produce them itself. Although they are essential, they do not constitute a source of energy and are not required as a "building material". So why are vitamins so important for athletes? The water-soluble (hydrophilic) vitamins include vitamin C and all the B vitamins. They can be found in all the aqueous parts of the body, that is to say, in the blood and intercellular spaces. With the exception of vitamin B12, water-soluble vitamins cannot be stored by the body. Any oversupply is simply excreted. This means that reserves cannot be created for "bad times". Liposoluble (lipophilic) vitamins include vitamins A, D, E and K. Because these are only fat-soluble and not water-soluble, they are not flushed out in the urine, they are stored instead. This allows the body to stock up the vitamins. The body can then use this "stock" in the event of a shortage. Vitamin supplements should ideally provide as complete a profile as possible of both water-soluble and liposoluble vitamins. The most natural raw materials guarantee an ideal composition. That's why at foodspring we attach great importance to the origins of our Daily Vitamins. Vitamins are gently extracted from real fruit through innovative filtering techniques and spray drying. Grapes, strawberries, apples and oranges provide you with everything your body needs. A fruit basket in a capsule, if you will. We also obtain the minerals from real plants, like spinach, broccoli, curly kale and algae extract. A balanced diet should normally cover your daily requirements. However, thanks to the stresses and strains of everyday life it is not always easy to maintain a balanced diet. When this is the case and if your needs are significantly increased by sports or other physical activities, it is worth buying vitamins in the form of dietary supplements. Vitamin supplements like Daily Vitamins are a natural and convenient solution. There are 13 vitamins in total. Daily Vitamins by foodspring cover your B vitamin, vitamin C and vitamin D requirements and top up your vitamin A requirements. All of these vitamins play important roles in terms of our health. High-quality vitamin supplements also contain minerals. These are additional so-called micro nutrients that we need to maintain our natural performance. Minerals are essential, i.e. they must be obtained from food. Trace elements are also included with the minerals, but as the name suggests, these are only required in small amounts. Trace elements include iodine, iron, zinc, copper, fluorine, phosphorus and selenium. If you decide to buy vitamins, should pay attention to serving suggestions that work well with your ordinary diet. 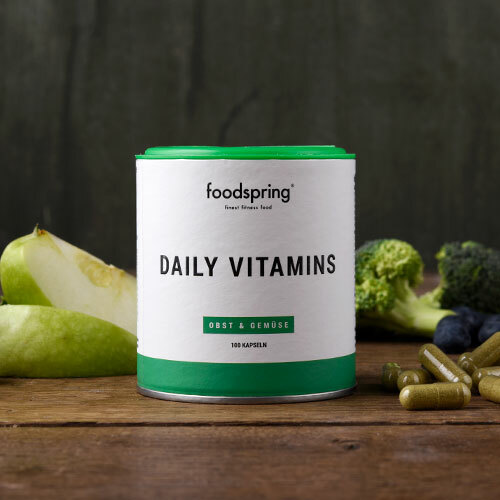 Daily Vitamins by foodspring are very simple to use: Take two capsules per day with plenty of liquid. It remains up to you whether you want to take both capsules at the same time or one in the morning and one in the evening. The important thing is to take them regularly to benefit in the long term. Whether you're an ultra-long distance runner or an avid fitness fan: If you demand a lot from your body, you also need to pay it back. Daily Vitamins by foodspring can support the regeneration process after strenuous exercise. If you are following an intensive muscle building regime you will have increased vitamin requirements, particularly after intense weight training and will benefit from an additional source of vitamins. Diets are often associated with a significant reduction in choice in terms of food, as well as a reduction in food itself. Ruling out high-fat foods and sugary fruit can quickly lead to nutritional deficiencies. The body is also generally weakened by a calorie deficit. This makes buying additional vitamins worthwhile. We all go through phases in our lives when our defences could use some support. If you work with children, take a tightly-packed train to and from work everyday, have a particularly stressful job or are recovering from an operation, you need a strong immune system. Daily Vitamins are a great "protective shield". The vitamin D contained in the Daily Vitamins is needed most during the dark winter months when the days are short and the sunlight, which the body needs to produce vitamin D, is reduced. Vitamin D is said to contribute to the formation of teeth and bones. Our Daily Vitamins contain a large number of essential vitamins and help you get through the winter months cold-free and full of energy. Vitamin supplements are among the best-selling dietary supplements in Germany. Nowadays you can find them on the shelves at discount supermarkets and on the internet, of course. The differences in quality are immense: A study in the German consumer magazine "Ökotest" showed that many suppliers fail to include an adequate dosage or include dangerously high doses of certain ingredients. When buying vitamins you should also be mindful of the origin of the vitamins and minerals. The vast majority of manufacturers produce purely synthetic ingredients in order to save costs. Vitamin supplements from natural raw materials should be given preference. <="" p="">Daily Vitamins by foodspring are made from fruits and vegetables and set new standards in terms of production processes. foodspring's vitamins follow strict EU regulations and guarantee an optimised composition of the components. Vegans buying vitamin supplements in capsule form should be aware that the capsules are usually made from animal gelatine. foodspring does not use any ingredients of animal origin, but rather capsules made from cellulose fibres. This makes them suitable for a vegan diet. Why should I use foodspring Daily Vitamins? Most vitamin supplements contain only synthetically-produced vitamins. These are grown in a lab to imitate their natural counterparts. However, this process does not yield the same quality as natural vitamins. The nutrient extracts in our Daily Vitamins come from real fruits and vegetables. We use a variety of raw ingredients so that our Daily Vitamins offer all the essential vitamins. Do Daily Vitamins replace the need for fruit and vegetables? We talk and give advice to customers every day, our primary focus being on raising awareness about a healthy, balanced diet. The consumption of fruit and vegetables plays an important role here. Our Daily Vitamins provide a near optimal daily supply of vitamins. But of course, a healthy diet should still include fresh fruits and vegetables. Why do you use real vitamins from fruit and vegetables? Artificial vitamins are created in the lab to imitate their natural counterparts, such as the chemical equivalent of Vitamin C contained in an orange. However, it is not always possible to create a 1:1 replica. Studies show that our body can differentiate between artificial and natural vitamins and can absorb the natural ones much better. To guarantee that our product is as natural as possible, with maximum bioavailability, we only use carefully extracted vitamins from fresh fruit and vegetables. Do pesticides used in fruit and vegetable farming do you any harm? The intensive use of chemical pesticides has an impact on health. The residues are like a poison to your body and cause it unnecessary harm. Moreover, the intensive use of pesticides endangers the health of agricultural workers, not to mention how these chemicals damage the soil and the environment. For the sake of your health, the health of others and the environment, we choose only to use fruits and vegetables from sustainable community farms that do not require the intensive use of pesticides. Are foodspring Daily Vitamins vegan? Our capsule shells are made of 100% natural, renewable cellulose. We are opposed to the use of cheap capsule shells made of gelatine and only use quality, natural raw ingredients for both the capsule and the ingredients contained within. Daily Vitamins will be back in stock shortly.